Baskets for allowing produce to dry after washing? Or, for more thorough drying, as would be needed for figs, apricots, peppers, etc.? Storing tobacco to keep it clean. See if you can get this one right. It was used in the garden and on the farm what is it and what is it designed to do? Wheel from a walk-behind cultivator? told2b wrote: Wheel from a walk-behind cultivator? Your close. They are actually from a 2 row farm field seed planter but the 1 row garden planter works on the same principle it has a smaller back wheel. The 1 row garden planter works the same way back wheel is designed to cover the seeds with soil. Can you use this in your garden. What is it? 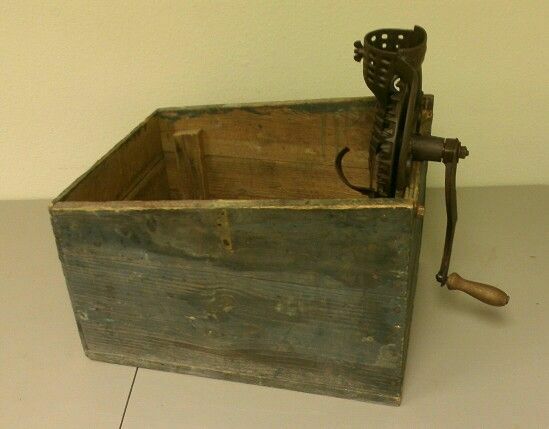 Looks like a corn shucker in a wood box. told2b wrote: Looks like a corn shucker in a wood box. My Grandmother used this in the kitchen every summer after harvesting vegetables from the garden. What is it for? It is someone else's turn to do a, guess what this is. I was thinking of what I would offer for a "guess what this is" and I visualized Gary's last one. Oh, and a few old garden tools. None of which I have handy to photograph. Any one of my siblings could identify many arcane tools that might date back to the 1800's. Some things can look pretty variable depending on where or how they are used. I've used a potato ricer to make applesauce for instance.